Yesterday was not a typical day for me. I awoke at about 4:30am, finished yesterday’s blog post, had breakfast–a fresh tuna cheddar melt, and headed down to the lake where not much was going on. Once I was back in the house I started packing and answering e-mails. Jim Litzenberg helped me prepare fish and chicken for my breakfasts on my short road trip. I plan on being home late on Tuesday. I left for DeSoto after lunch–baked flounder and butternut squash, at 12:30pm and arrived at East Beach just after 3:00pm after a few short pit stops. I did not even have time for a nap. Everything worked out great for the rest of the afternoon and we did not leave the beach till the sun touched the western horizon over the Gulf. After we checked into the hotel co-leader Bob Kimbrell, Deirde Scheer Gross and I went for a quick dinner at the Seaporch Grill. Having left my insulin in the fridge at the hotel room I order only a cerviche but it was so good that I had another one. My body reacted well as my blood sugar was only 87 at 9:30pm. I had three small bites of chicken for some additional protein and injected 3 units of fast acting insulin along with my overnight 5 units of slow acting. This morning my blood sugar was 75. 83 is the target. Then I started working on a Turkey Vulture head shot for the blog but could not get the REDs right. Tried a crane head shot from the morning with the same problem; the REDs were way off. I think that I need to re-color calibrate this laptop…. Then tried a shorebird group shot and decided that I did not like it. By the time I was happy with the Marbled Godwit image below it was nearly midnight and the Orioles Royals MLB playoff game was tied at 5. Not wanting to stay up till the end I turned off the TV, set the alarm for 5:00am, read for two minutes, and fell asleep quickly. From 9:00 till midnight I was in a sort of non-tired zombie state knowing that I should be tired but continuing to work…. As I said, it was a long strange day for me. Without a nap. This blog post, the 315th in a row, took me about an hour to prepare if you don’t count the 2+ hours that I spent on the misfires! It was published just before 7:15am from my motel room in St. Petersburg Beach, FL. This image was created at 5:23pm on the afternoon of 10 October, on the first-ever BIRDS AS ART Meet-up In-the-Field Workshop. While seated in the very warm lagoon water employing my knee-pod technique, I used the the hand held Canon EF 200-400mm f/4L IS USM lens with Internal 1.4x Extender with the internal extender in place at 513mm) and a beta version of the Canon EOS 7D Mark II . ISO 400. Evaluative metering +2/3 stop as framed: 1/2500 sec. at f/6.3 in Manual mode. Central sensor/AI Servo Surround/Rear Focus AF on the spot where the bird’s breast meets the bird’s belly was active at the moment of exposure. Click here to see the latest version of the Rear Focus Tutorial. Click on the image to see a larger version. Wanting to keep things simple, I went with the hand held 200-400 and the 7D II for most of the afternoon. By 5:30pm, hand holding the 200-400 became too much of a chore. Co-leader Robert Kimbrell kindly loaned me a sturdy off-brand tripod topped with a Wimberley V-2 Tripod head. This combo worked just fine. I used it with and without the internal TC engaged and at times I added an external TC to give me a maximum reach of 784mm. That times the 1.6 crop factor left me at an effective or equivalent focal length of 1254.4mm. You had better be holding that puppy still. 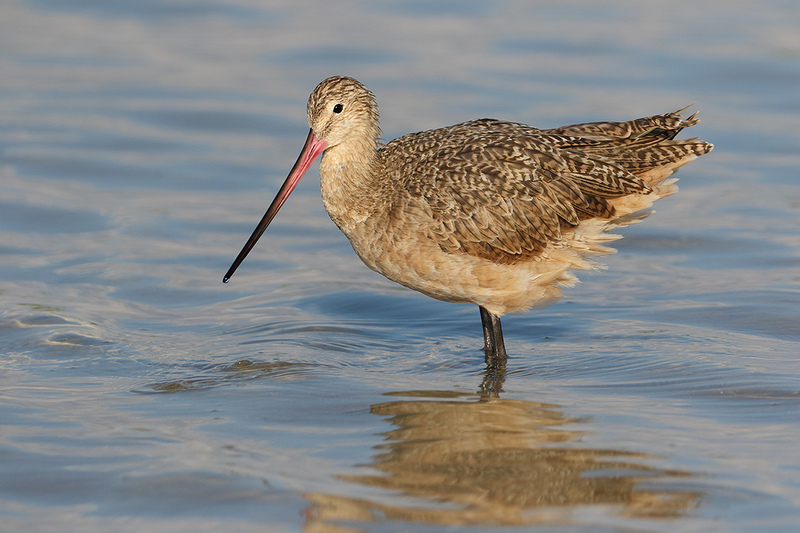 I created about 150 images of Marbled Godwit yesterday afternoon. This leaning forward pose was one of my favorites. Wow! The high ISO images went from 5$ each to $50 each ! Now that is inflation South American style ! Disregarding the newer features and pizazz, and considering focal length and pixel density. Does the 7DII exceed the Mark IV in image quality with same lens at same distance, when upsized or downsized at iso 800 and below? Many have pondered this question and considering moving from the IV to the 7DII if they can experience an improvement in image quality. Thanx Art. ps: that said I can say that I love the 7D II image files and am impressed with how it does with high ISO noise…. Yes I would love to see images in the real outdoor world from the 7D 2 with ISO above 400 since evaluating how it does with ISO 800 plus. My biggest complaint with the 7D now is ISO and noise above 400. Software has improved over the years to help but would rather start with a cleaner image. I will be offering more than a few 7D II high ISO RAW files for the bargain price of only $5.00 each over the next week or so. The first one was the Willet head shot on 11/15. If you continue to capture images with the beta version of the 7DM2 up until sunset (or at sunrise for that matter) I would hope that you intentionally push the ISO setting significantly beyond what you would otherwise to evaluate the resultant noise. I only raise the ISO when I need to :). There will be lots of high ISO 7D II images coming soon. You can purchase them for only $5.00 each to take a close look at the noise in various higher ISOs including 800, 1600, 3200, and 6400.